It's not often my husband emerges from the kitchen and presents me with something he has made. The occasional beans on toast. An annual Mother's Day roast. Anniversary steak and chips. All of which, I'm very grateful for. But this. This is on another level. I didn't see it coming and to say it was delicious is a colossal understatement. 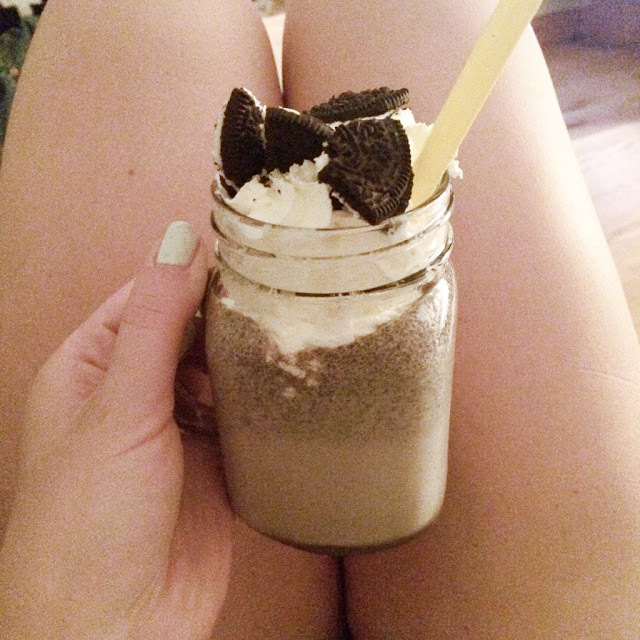 This is Dan's Oreo Milkshake. I must admit, it's only a few ingredients and a blender. Hardly a Blumenthal-esque concoction, but he assures me the ratio of cookies to ice cream is critical. Who am I to argue...? Put all your ingredients, aside from the cream and the one extra Oreo in your blender. Blitz until smooth. Pour, top with squirty cream and crumble your last cookie on top. Enjoy and try not to think about the calories. It's worth it. Hmmm I might try making this with a spoonful of peanut butter added to the blender next time. I'm wild like that!